Henshaw, Albert L., age 37, born in Missouri; father born in Virginia; mother born in Maryland; occupation: feed yard. Henshaw, Sophia C., wife, age 25, born in California; father born in Maryland; mother born in Ohio; keeping house. Henshaw, Louisa C., age 3, born in California; father born in Missouri; mother born in California. Henshaw, George R., age 1, born in Arizona; father born in Missouri; mother born in California. Henshaw, Albert, head-of-household, age 57, born Apr 1843 in Missouri; father born in Virginia; mother born in Maryland; married 25 years; occupation: farmer. Henshaw, Sophie, wife, age 46, born Sep 1853 in California; father born in Maryland; mother born in Ohio; married 25 years; 5 children, 5 living; owned farm (free). Henshaw, Louisa, daughter, age 23, born Sep 1876 in California; father born in Missouri; mother born in California; occupation: teacher. Henshaw, George, son, age 20, born June 1879 in Arizona; father born in Missouri; mother born in California; occupation: clerk. Henshaw, Mary, daughter, age 17, born Oct 1882 in Arizona; father born in Missouri; mother born in California; attended school 9 months. Henshaw, Jennie, daughter, age 14, born Dec 1885 in Arizona; father born in Missouri; mother born in California; attended school 9 months. 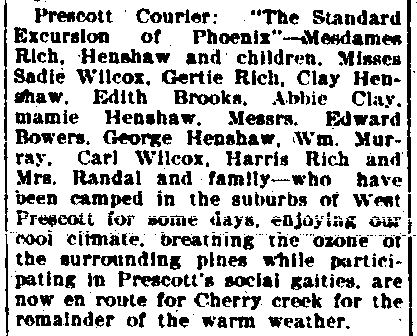 Henshaw, Fred, son, age 12, born Oct 1887 in Arizona; father born in Missouri; mother born in California; attended school 9 months. Sumers, Mack [unclear], boarder, age 65, born Sep 1834 in New York; parents born in New York; single; occupation: farmer. Henshaw, Albert L., head-of-household, age 67, born in Missouri; father born in Virginia; mother born in Maryland; first marriage, married 39 years; occupation: farmer, own farm; owned farm (free). Henshaw, Sophia C., wife, age 57, born in California; father born in Maryland; mother born in Pennsylvania; first marriage, married 39 years. Henshaw, Frederic C., son, age 22, born in Arizona; father born in Missouri; mother born in California; single; occupation: farmer, at home. Waite, Simson T., boarder, age 73, born in Vermont; parents born in New York; widower; occupation: none. Sture, Virginia, daughter, age 24, born in Arizona; father born in Missouri; mother born in California; married; occupation: none. Sture, Florence, granddaughter, age 2, born in Texas; father born in Minnesota; mother born in Arizona. Henshaw, Albert L., head-of-household, age 87, born in Missouri; father born in Virginia; mother born in Maryland; first married at age 32; owned home ($5000 value); no radio in home; occupation: none; not a veteran. Henshaw, Sophia C., wife, age 76, born in California; father born in Maryland; mother born in Ohio; first married at age 22. 1880 census, Phoenix, Maricopa County, Arizona; roll T9-0036, ED 18, page 103A-B, line #49, dwelling #263, family #263. Death certificate for Louisa Clay Henshaw. Death certificate of Mary Susan "Cubbins" Henshaw. "San Francisco Call 1875-1884 Births, Marriages and Deaths"
The San Francisco Call archives: http://feefhs.org/fdb2/sfcalli.html. 1930 census, Los Olivos Township, Maricopa County, Arizona; roll T626-59, ED 93, page 2B, line #78, dwelling #29, family #31. "The Arizona Republican", Jul 23 1896; http://www.ancestry.com.